This one-piece USB speaker delivers amazingly loud and vibrant sound for its diminutive size, but suffers from a lack of mids and highly directional sound. When it comes to selecting USB speakers to replace the ones built into your laptop, there’s typically a few varieties to choose from. Some speakers are meant to be stood on a desk and aren’t particularly well suited for couch use, some may latch onto the sides of the laptop screen, and still others will grasp the top of the screen in a one-piece soundbar configuration. No matter the design there’s usually an excess of USB cable slack to contend with along with excess connecting wire if the speakers are split. Throw in yet another cable if the speakers happen to be analog. It’s hard to argue with the reduced bulk and insane portability of the little guy. It takes all of one second to plug the speakers in, and one second to remove them. Three seconds if a bag is involved. 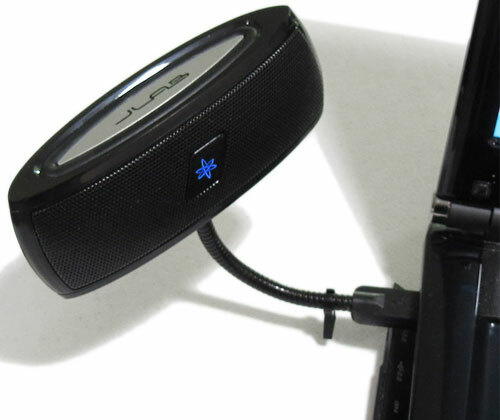 The stalk design shares a trait with soundbars in that it’s versatile enough to be used on a couch, but unlike soundbars it can also be used with a desktop computer if there’s a powered USB hub nearby. So how does the new X-Bass expand upon the unique design of the original B-Flex, you ask? By incorporating a small removable bipod forged out of a cent’s worth of sturdy plastic. Don’t laugh. Believe it or not this tiny kickstand acts as an excellent conduit for resonating the X-Bass’ imposing sound through wooden desks. That is, of course, assuming your laptop isn’t so thick that the kickstand is raised off the desk like it is with my 17″ gaming behemoth. The other, more obvious function of the kickstand is to stabilize against bass kicks at high volume – an excellent function to have considering the X-Bass now sports a passive subwoofer that adorns the top of the speaker pod. While not unprecedented, the use of a subwoofer is certainly a rarity for laptop speakers, and I’ve yet to see any others incorporate it into such a small enclosure at only 5″ x 1-1/2″ x 1-7/8″ without the stalk. The subwoofer’s silvery dust cap does wonders for contrasting with the smooth black of the casing, though I can’t help but wish there was a metal grille protecting the woofer like there is for the micro drivers. Even though the metal dust cap and rubber boot seem durable enough on their own, the silk screened JLab logo scratches off easily with a fingernail. Alas, JLab fails to provide a protective travel case for the X-Bass, and I’d hate to see how a rogue HDMI or USB cable plug would mark up the woofer or scratch the glossy surface inside the abyss of my laptop bag. 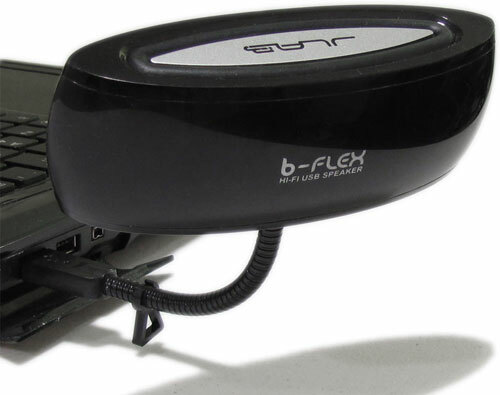 The B-Flex X-Bass performs surprisingly well for just how small it is. The tiny speakers pack a punch in the volume department, easily 5x as loud as the Altec Lansing speakers in my 17-inch Asus G72GX laptop and roughly twice as loud as Logitech’s premium Z305 soundbar. The X-Bass is only ever outclassed by Logitech’s older V20 USB speakers, but sadly those are long discontinued and don’t have portability in their favor since they’re meant to be stood on a desk. 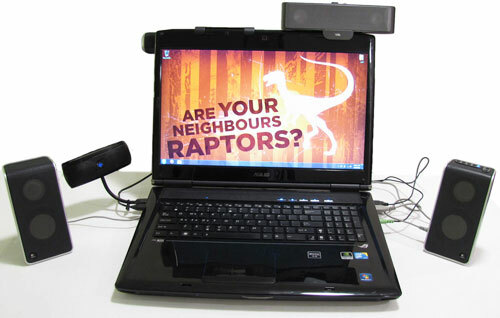 From left to right: Logitech V20, JLab B-Flex X-Bass, Logitech Z305, Cyber-Acoustics CA-2880, and the laptop’s built-in Altec Lansing speakers. The X-Bass’ powerful dual amps do come with one major drawback, however, and that’s their need for moderation. Like the Logitech V20 speakers before it, the X-Bass can easily suffer from a flickering LED, audio clipping and dropouts if the volume is turned up past 80% for songs with a heavy bass line. USB 2.0 ports can only provide so much power, after all. In an extreme case, the speaker even managed to knock a USB port on my externally-powered G19 keyboard offlline until the keyboard was re-plugged. That said, I don’t really view this liability as a negative. I’d rather have the extra amplification there for when I need it such as a YouTube clip with quiet audio, than to have a speaker that never experiences dropouts but is permanently soft. I’m sure plenty of tech support departments would love to disagree with me on that one. In any case there’s plenty more to the B-Flex X-Bass than just volume. 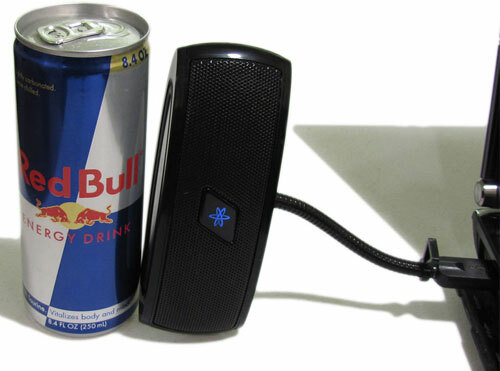 For one, the audio is digitally driven by USB so any electrical noise is guaranteed to be dead on arrival. You could have the worst sound card in the world and it wouldn’t matter since USB audio supplies its own. Whereas my assortment of analog headphones and my analog-driven but USB-powered Cyber Acoustics CA-2880 soundbar all pick up a range of quiet hisses, scratches, pops and whines that fluctuate with my CPU load, the X-Bass delivers nothing but clean audio. Sound on the X-Bass is rich and vibrant, again putting to shame the likes of my Asus laptop and the larger, less expensive Cyber Acoustics soundbar that sounds utterly hollow in comparison. Highs are nice and crisp, sometimes painfully so in the case of Judas Priest’s Painkiller, and the bass definitely has a good amount of kick to it that you can actually feel without getting as boomy as the V20’s low end. In both of these categories the X-Bass again bests the Z305 and make the X-Bass seem unusually well suited for listening to Cypress Hill, provided you don’t exceed that volume threshold. Unfortunately it’s not all rainbows and unicorns for the X-Bass as there are two notable flaws that hurt its overall appeal. As with any sound device this is incredibly subjective, but the X-Bass sounds empty and superficial compared to the more rounded approach that the V20 and Z305 speakers take. There are no midtones here. It’s as if someone made a smiley face on a graphic equalizer that emphasizes the highs and lows, vocals be damned. 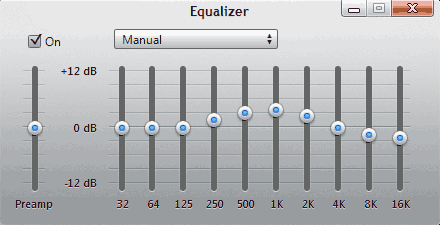 Tweaking the EQ in your favorite media player to bump the mids and slightly dip the highs definitely helps, but this unfortunately can’t be done for web browsers or Windows Media Center. This step should have been in the instruction manual. The other major flaw with JLab’s X-Bass should be obvious; it has highly directional sound that’s centralized to whatever side of the laptop it’s plugged into. I didn’t think this would get to me as much as it does, but it’s akin to having a speaker in a car door go silent. Sound still reaches the other ear, but music is nowhere near as enveloping. Even when the X-Bass is positioned directly in front of me with my desktop computer setup, the X-Bass still can’t escape the monaural sound that befalls it. With the left and right speakers bunched so closely together there’s very little separation such that discerning positional audio cues in games and movies is near impossible. So while the X-Bass is indeed stereo as its spec sheet would suggest, you’re better off mentally classifying the X-Bass as mono. Overall I’d say I’m rather pleased with the B-Flex X-Bass and the surprising amount of sound it pumps out for its size. The crisp highs and kicking lows certainly live up to the hype surrounding the B-Flex brand, though you’ll want need to tweak the EQ in iTunes to make up for the neglected midtones. The unique design also works well for laptop and desktop users alike at the desk or on the couch, but ultimately ends up hurting the lasting appeal by delivering a monaural sound that’s highly directional and hardly enveloping. Ultimately the X-Bass is a great step up from laptop speakers and most cheap $20 USB speakers, but I wouldn’t want to pay more than the current $40 sale price JLab is asking for.